Named for John Nichols, Mayor of Los Angeles twice in the 1800s, Nichols Canyon is a quite neighborhood often populated by the famous. Nichols has a year-round stream and many water falls which draws hikers and bicyclists into the canyon. The 20th Century artist David Hockney created at least 2 paintings depicting the Canyon, including "Mulholland Drive" and, of course, "Nichols Canyon." While not as "famous" as its neighboring Canyon neighborhoods, like Laurel Canyon, Nichols Canyon and, more specifically Mulholland Drive, has been home to some of Hollywood's most famous stars. In fact, Mulholland Drive was known as "Bad Boy Boulevard" years ago, being home to Jack Nicholson, Warren Beatty AND Marlon Brando! Imagine having those three as neighbors! Location: Runs the length of Nichols Canyon Drive from Hollywood Blvd on the South to Mulholland Drive on the North. 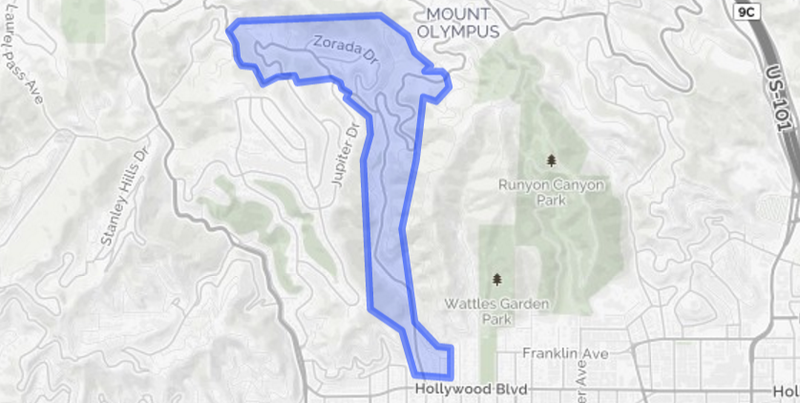 Set between Laurel Canyon to the West and Runyon Canyon Park on the East. Falling in love with Nichols Canyon?